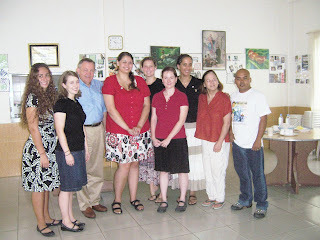 Here is our group with the Director of the Peace Corps, Ron Tschetter. It was great to meet him and his wife Nancy. He told a great story about how every volunteer can make a tremendous impact not only on individuals overseas but on the country itself. The story he told us specifically was how one day he was called at his office to meet with a man in a nearby hotel. The man he met wanted him to know that he credits the married PCV couple that lived in his country and helped him make his way through school for all the success he's had in his life. The boy who was once a shoe shinner in Lima, Peru was elected as President of Peru. Those PCVs made a tremendous impact on not only him, but also those of his country. It was feel good story and I really enjoyed listening to him speak... plus he gave us patches and pins. Hey Buckwheat! Thank for the post. I guess the Peace Corps is the closest thing the US government can get to mission work without calling it mission work. The director's story reminds me of stories we hear at Pura Vida and stories Tim has shared about Costa. I know you have already made differences in people's lives. You make them every time you smile or speak. What a great story. Indeed, you are making a big difference by being a volunteer. And I would like to thank you for volunteering for my people. i know... the skirts are really coming in handy!